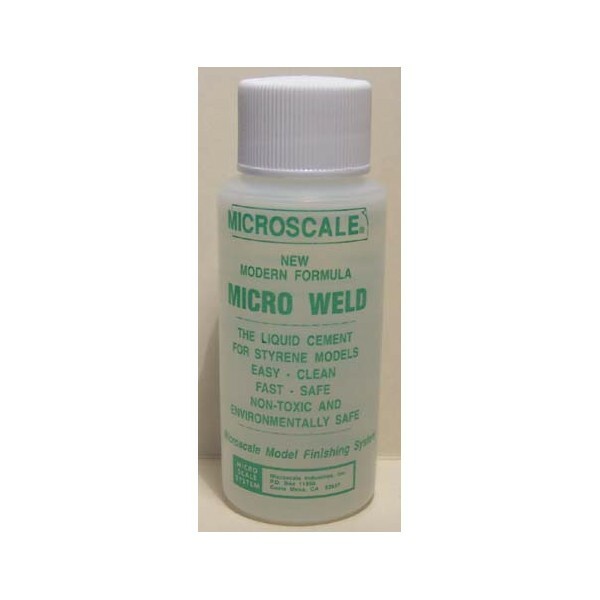 There is nothing quite like the new Micro Weld styrene solvent cement, and you will find that application, although easier, is very much different from the old. You will also find that it is much more forgiving, stronger when dry, and will not craze clear plastic or tend to warp thin plastic parts like other cements. Since it will not ""lift"" most paints, it can be used to repair models without repainting. No longer do you need to hold the parts together while applying adhesive to the seams. You will now have both hands free to position parts properly. 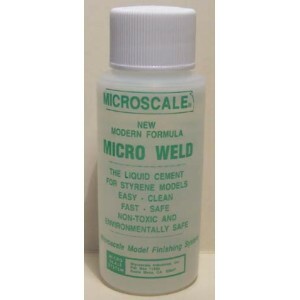 This is the way to apply the new Micro Weld : using a small artist’s brush apply a thin coat of Micro Weld to the edges of the parts to be joined. The coated edges become very tacky like contact cement. Now join the parts by pressing together. You will have a few seconds to remove or realign the parts for a perfect fit. Avoid getting cement in unwanted areas, but if you do allow a couple of minutes to dry before touching or you may mar the finish. And that’s it, just allow to dry completely before painting. You now have a strong bond that is not brittle and will last.